Average ratings are based on the published values and not the values entered in your own log entries. If it were possible to navigate the trails in this park, it would be a pleasant fall/winter/spring hike, with plenty of trail available for long, medium, or short hikes. 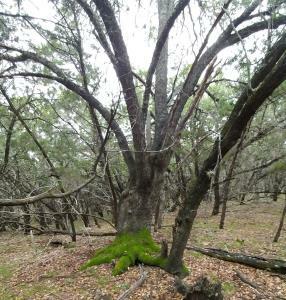 Nothing spectacular, but pleasant, if fairly standard, hill country grasslands and cedar woods. There is intermittent cover, but not nearly enough to make a July or Aug hike enjoyable. BUT. The whole thing is really poorly signed, the map doesn't even show parking lots or trailheads, and there are a number of gnarly trail junctions that are very difficult to navigate without signs. We lost our trail, we lost our car--what was supposed to be a 6-7-mile hike ended up being an 11.7 mile hike. Not fun. We'd probably still be there, wandering helplessly, if a very kind pair of trail runners hadn't spotted us, guessed that we were lost, and led us back to civilization. If you live in the area, it's probably worth learning your way around, but bring twice the amount of water you think you need, a fully charged cell phone, and, preferably, a GPS unit. Oh, and drop a pin where you park your car. The Well/Weil trail--an old Jeep track--offers the fewest opportunities for misdirection, so I'd recommend doing your first hike there. Or just don't bother--Muleshoe Bend and Grelle are ~10mi away, are prettier, and are easier to navigate. This trail was hard to find, as Google tries to convince you to enter through a gated apartment complex. In fact, you need to turn into the subdivision around the corner from the apartments to find the entrance--take Mesa to Burney to the tiny dead-end street of Sterling and there it is. But I'm glad I dead, as a short little excursion in pleasant surroundings was just what I was looking for. The whole trail is paved, though the pavement has become a bit wavy with age, so it might not be 100% accessible for the especially frail. The path winds though a small wood and eventually reaches a nice observation deck overlooking a little ravine. I thought the overlook was a bit of an anti-climax--you can't see much due to the density of trees, even in the winter. But for a nice, quick saunter, it's a good choice if you're in the area. Note that dogs are not allowed, as it's not just a park but a nature preserve. Nice variety of ecosystems, including cedar woods, hardwood forest, and prairie, as well as some lake views. Some up and down, but not so distractingly strenuous. There was almost no one else on the trail. Well marked and generally in good shape, like a number of other LCRA parks we've visited. It's not perfectly clear whether hikers are allowed on the biking trails, but we eventually decided that, yes, they are, and no one yelled at us, so apparently it was all good. Be sure to bring small bills, as the fee is collected via honor system, and you have to have the correct amount. Saw a lot of nice lichens. Hiked the Wildlife Trail and pootled around the Wlnut Slough area of the northern part of the park. The trail was mostly level, with a couple of nice bridges/boardwalks over the lake. There were a few roots but it was generally pretty easy footing. The bright, brisk October weather was gorgeous, most of the trail was shaded, and we saw lots of neat plants, from wild southern Magnolias to American beeches and black walnuts. Will definitely return to do more hiking. There are also extensive paddling trails, so would love to come back with a kayak. Like a lot of trails in Texas, this one's enjoyability depends heavily on the weather. Today it was a solid 4, but when it's hot and humid out, it's more of a 3. Highlights--a poop-ton of butterflies! It's October, and there are butterflies all over the place. Nice lunch spot in the bed of the now-dry creek, under a rocky, ferny bluff. Good shade coverage for much of the hike. Saw a neat green snake climbing an oak tree. Another big oak totally festooned with Spanish moss. Plenty enough trail to get a nice, long hike. When you're hot and tired, the hike up from the creek to the hilltop can be a chore. A lot of ankle-twisty rocks. Gnats and mosquitos can be bad in the creek valley.